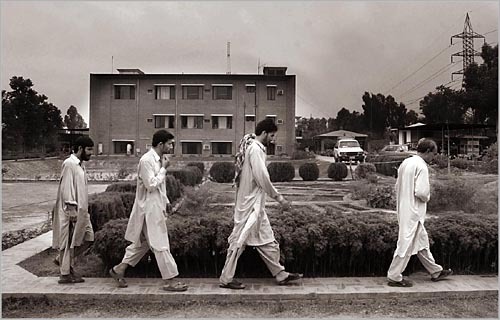 Afghani heroin addicts undergoing treatment walk to lunch at the headquarters for the Dost Foundation in Peshawar, Pakistan. The foundation treats and rehabilitates some of Pakistan's estimated four million heroin addicts. Pakistan and neighboring Afghanistan grow and trade much of the world supply of heroin, leading to severe addiction problems amoung their own people.